Last weekend we drove to Iowa for the Pigman longcourse. This time, it was my husband Ken's turn to race, and the boys and I would cheer him on. Hotel: We stayed at the Marriott in Cedar Rapids. It was beautiful and we got a great Pigman rate. Packet pickup was in the hotel on Saturday, very convenient. Race site: Pleasant Creek Recreation Area. The park was about 15 minutes from the Marriott. Race parking: The Pigman has several lots and a big grassy area for parking. They have volunteers helping direct parking on race morning. But, once you park, don't plan on leaving the park. The drive out of the park is narrow, windy and gets very crowded with bikers/runners also sharing the route. It's best to stay put and wait for your racer to return. Race course: The lake was 77 degrees on race morning. 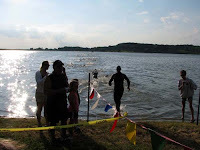 They started with a time trial swim start, so one person left every three seconds. The road quality on the bike was good, though in Iowa the shoulders aren't paved. The is very little shade on the run. The route is hilly and beautiful, but gets very hot. Watching the Pigman: Our kids played on the beach while Ken swam, and while he biked. The park had a small concession stand open serving food and drinks. There is little shade along the final miles of the race. Many groups brought their own canopies for shade. We had a big umbrella. Bring something for shade, swimsuits, sunscreen, blankets and money for food, drinks. We were able to catch Ken coming out of the lake, and in transitions. He had a great race and we enjoyed the day in the park. Overall, we are impressed with the Pigman.